What could be any merciful and the most interesting news for the entire fraternity is not what ‘Puratchi Thalaivi’ Amma swearing in as CM for Tamil Nadu for the fifth time but the Gixxer Championship for the Motorsport lovers which is to kick start on June and to be continued till October 2015. Another piece of information is that the Gixxer Cup Championship marks Suzuki’s foray into the Indian motorsport scene. The championship will be held alongside the Indian National Motorcycle Racing Championship and will be split into two parts. Besides all, a ‘novice’ championship for amateur racers will run parallel to the ‘open’ championship which is meant to draw many experienced drivers. Each category will consist of 20 racers on the grid. Much above, all races will happen in two exiting parts in India. The five rounds of the series will take place at the Kari Motor Speedway in Coimbatore and the Madras Motor Racing Track in Chennai. Suzuki takes care of every pre and post procession of Gixxer championship that is soon going to unveil soon. The fully faired Gixxer SF will be provided by Suzuki in this one make series and each racer will have a pit crew and a team of experts for support. Of all, Suzuki claimed that the aim of this championship is to lay the foundation of its global racing culture in India and to promote motorsports and the spirit of sportsmanship. “Suzuki is a legendary name in the racing world, and Suzuki motorcycles are among the fastest and most finely crafted racing machines in the world. Apart from showcasing the real potential of the Gixxer SF to Indian motorsport enthusiasts, this championship will double up as an opportunity for local racers to hone their skills by providing them an affordable platform to gain valuable racing experience and exposure to the dynamic sport of motorcycle racing,” said Atul Gupta, executive vice president, Suzuki Motorcycle India Private Ltd. 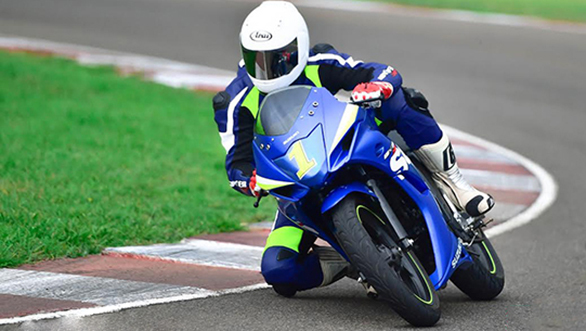 The Madras Motor Racing Club will take responsibility as organisers of the championship and has already got the Gixxer Cup approved by the FMSCI.